The Excalibur convention was a multi-media TV fantasy convention running over the weekend of 13th-15th August 1993. It was run for the benefit of the National Meningitis Trust Charity. Excalibur was our first Robin of Sherwood convention, though we had been to one other convention before (Who’s 7, a Blake's 7/Doctor Who convention). The convention was for four main TV series; Blake’s 7, Garrison’s Gorillas, Young Riders and Robin of Sherwood. Lucy and myself went for the one day, Saturday as we understood that Michael Praed and Clive Mantle would be there. Christopher Cary, who was in Garrison’s Gorillas, was the other main guest, but he would be mostly appearing on Sunday. We made very good time from Horsham and arrived there about an hour before registration opened! The guest talks and the auction weren’t until the afternoon so after having a coffee and snack we waited to register and attended the opening ceremony and then promptly got roped in to the sports activities where we (the red team) annihilated the opposition and won first prize! This was an unprecedented first taking into account my performance at PE at school! While recovering, we then talked to various other attendees which didn’t take long as there was only about a dozen or so, we were a little surprised as we thought most conventions were big (about 400 people at Who's 7). This didn’t worry us too much though as it meant a higher attendee to guest ratio! We also found out that Clive Mantle couldn’t attend the convention due to work commitments but Nickolas Grace would attend instead. As it happens NG portrayed my favourite character in RoS so I was more than happy with the situation. The dealer’s room was quite small, only having a few dealers in it, displaying mainly RoS and Blake’s 7 merchandise. I was surprised at the prices of various RoS story zines such as Albion, the cheaper ones were in the region of £18. I didn’t buy that much apart from a few photos, as we wanted to save our money for the auction and in particular a lovely piece of artwork that caught our attention during the opening ceremony. I first realised that Michael Praed and Nickolas Grace had arrived when Lucy rushed into the bar, (I was losing a game of pool at the time!) promptly followed by MP and NG themselves. Lucy seemed unnecessarily excited, her eyes sparkling with some old school girl type crush. I was a little embarrassed and was relieved that neither of them had any effect on me whatsoever! I had a geography teacher who was the spitting image of MP and I half expected him to ask me what I was doing since I left sixth form college. MP and NG went to the bar to have a few drinks and some lunch. I had in the meantime had dragged Lucy to a less conspicuous location and sat at the other end of the bar discussing various bidding tactics for the auction, talking to other attendees and what we thought of the convention so far. After lunch it was time for the highlights of the convention, the auctions, the guest talks and autographs! The first auction was for con funds. It didn’t have many outstanding items although it did have a few interesting magazines. The auctioneer was good especially considering he wasn’t a fan of any of the series. He also doubled as the DJ at the con disco. We picked up a few items but we were holding out for the various charity auction items including the artwork. The Charity Auction was chaired by both MP and NG and they were a great double act clowning around with Star Trek bendy action figures, saying quick one liners and signing items of on behalf of other actors! For example, Lucy bought a poster of the film The Abyss and NG and MP signed the poster as Ed Harris and Mary Elizabeth Mastrantonio doubling the amount bid for the item! Paul Darrow’s novel Avon - a Terrible Aspect received similar treatment when bids weren’t going too well, NG signed it as Paul Darrow and bids shot from 25p to well over £5! It became apparent that NG felt much more at ease doing this than MP, he was a natural auctioneer getting the maximum bids for the various items. MP took a back seat in his usual quiet manner and let Nickolas do his exuberant sales pitch. Michael said a few quiet witty remarks but for me NG stole the show. Towards the end of the event they both auctioned off various signed publicity photos of themselves from the series getting very good bids, this was mainly because of them promising to hug, kiss or massage the winning bidder! NG got so excited with the bidding process he promptly spilt a pint of Guinness over the photos while signing them! However, the girl winning didn’t mind as she got a kiss and hug into the bargain. Finally it came to the auctioning of the artwork drawn by Martin Wilkie. There were four pieces of artwork on display, one for each of the series covered by the convention. Two were in the raffle and the other two were up for auction, including the RoS one that we were so interested in. They were all beautifully drawn in coloured pencil, and the minimum bid for the ones being auctioned was £50. However, they were so good that MP and NG reckoned that their value was nearer £200 each. Anyway, after some very intensive bidding Lucy and I secured the Robin of Sherwood drawing for £85. It was the worst 10 minutes of my life, and I was so tense! However, looking back, I can see that it was a good investment and well worth every penny. (It only took us eighteen months to get it framed!). 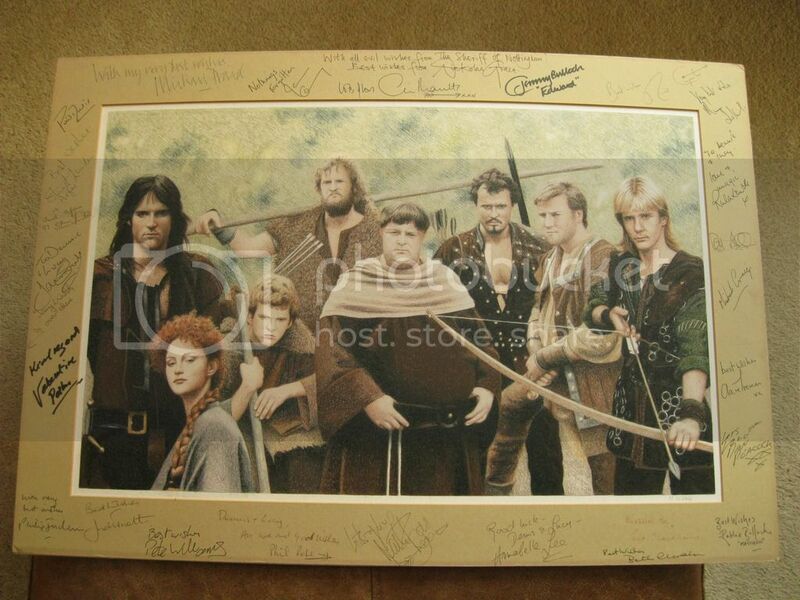 NG and MP had both autographed the picture, and they said we should go to the Greenwood convention in Surrey a few weeks later when most of the cast would be there for the 10th anniversary of the start of filming of the first series of Robin of Sherwood. They said that the cast would be more than happy to sign it which would make it even more prized a possession. Lucy and I were impressed by this as it is not every day that you get invited to a convention by a guest! After the Charity Auction the guests then had a Q and A session with the attendees. This was very good as there were only about 25 attendees to 2 guests, a rare situation in popular fandom! There was a very friendly atmosphere, and after asking us all what our names were they got down to a few questions. The following is an extract of the more major questions. Q: What do you remember about the series, any best bits? 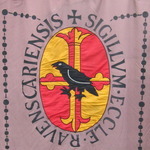 In particular he mentioned an incident which took place towards the end of the filming of the first series when the American backers were present. They were shooting a major scene in which Guy of Gisburne would march into a crowded hall clearing the peasants announcing the sheriff, and then the sheriff has to make a long speech. This was all rehearsed and all went well at the rehearsals remembering lines etc. However, when it came to the shoot Guy of Gisburne cleared the peasants saying ‘..my Lords and Ladies I bring you the Lord High Sheriff of Nottingham....’, the sheriff took his place and instead of doing his speech, burst into song from the musical Guys and Dolls! The extras and cast applauded but the American executives were livid as they thought Nickolas was making fun of them and that the wasted shoot cost £1000, so they were not happy at all. NG and the executives had a little meeting in their office afterwards warning him not to clown around again! Q: In the episode The Enchantment with the wind machine (in Belleme’s castle), were the cast all laughing or was it my imagination? A(NG): “Actors never laugh! Robin of Sherwood isn’t famous for its number of out-takes!" NG and Robert Addie played another joke during this scene while on the battlements of the castle by singing “The Walls of Jericho” which cost Goldcrest another £1000! Nickolas also loosened the fastenings on his wig, moustache and beard so when filming a scene in which he was battling against the wind, there is an out-take with his hair being blown off. A(MP): The worst thing about the wind machines is that it throws up all sorts of debris and leaves and if you wear contact lenses it is very difficult to see as you can tell if you watch the episode closely. Q: What do you remember most about Robin of Loxley’s death? A(MP): “That final scene before my death on the mound.” During the filming of The Greatest Enemy Michael was talking to the director about his idea that Robin would fire his last arrow as a gesture of defiance without aiming it. The director wasn’t too sure but after some discussion they tried it, time was pressing and the light was fading fast and suddenly the director saw Michael in the pose holding his longbow in the sunset. He told him to hold it there while he repositioned the camera for a more dramatic shot further away, positioning him on the crest of the rock silhouetted against the sky. Obviously they used filters for the final shot but it got the desired result. Michael wanted Robin to form an image of solidarity - standing against the odds. A(NG): The Greatest Enemy was a wonderful and beautifully filmed episode, perfectly shot, the best episode they ever did and it had some powerful moments. Someone mentions that Michael Praed was nominated for a possible role as the Doctor in a new Dr Who series. Michael responds that he hasn’t heard anything and that Nickolas would make a better Doctor. Nickolas says if asked that he would love to be the Doctor and that he enjoyed watching the program and liked most of the portrayals of the Doctor that the various actors had created. The attendees and guests then discuss the various inadequacies of the BBC, lack of quality cult dramas etc. Q: What did you think of Jason Connery’s interpretation of Robin? M & N also gave positive comments on the two Robin Hood films saying that it was nice that the legend had made it to the big screen and that it could only generate more interest in Robin Hood. Q: (to MP) Weren’t you in an Enya video? A: “Yes, in a very dodgy wig!”...Michael got a phone call from a friend about being in a video for Enya. He was very keen to be in it as he knew Enya’s sister, Maire from Clannad. While shooting the video Michael was asked if he would like to meet Enya which he did. He was escorted into her massive trailer by a brace of security men and came face to face with Enya. Michael tried to start a conversation by asking how Maire was. Enya looked as if she had had a bucket of cold water thrown over her and Michael was quickly escorted out, and wasn’t asked in again. It wasn’t until later that Michael was told that Enya and Maire don’t talk and so this is a taboo subject to mention in front of Enya. Nickolas commented on (the lack of) Enya’s generosity of spirit, and how she should have put Michael at ease. Michael and Nickolas then talked about their (then) current and imminent projects, various plays, TV programmes and films that they were involved in. This included Nickolas Grace in a Sharpe episode, as a Spanish Inquisitor, and Michael Praed’s film Staggered. They also expressed a desire to see us at the Greenwood Convention in a few weeks time. Before leaving they were presented with a couple of plaques and were mobbed for photos and autographs. Later on in the evening, before the disco, Lucy entered the fancy dress competition as a Saxon lady and won first prize, a drink from Christopher Cary! In summary of Excalibur 1993, I was fairly impressed with the whole event. It was quite well run, events ran to time and the organisers were very friendly and helpful. Although the convention was small it didn’t detract from my enjoyment simply because you could have a greater share of the guest’s attention. My only regret was that I wish I knew more about Garrison’s Gorillas because Christopher Cary seemed a really nice man and had an enthusiasm for fandom rarely found amongst many actors, and I wished that I could have stayed on the Sunday and listen to what he had to say for his talk. He also seemed very happy with the Garrison’s Gorillas artwork which he got for himself at the auction. It is not often that you see an actor enjoy himself so much. If there is another Excalibur convention I would recommend that they keep it to a similar arrangement. There is much to be said for the smaller convention, you may spend a little more time sitting around waiting for events to happen but you do get an added personal touch with fellow attendees and guests. Looking out for nesting pigs! This is review that appeared in the Nothing's Forgotten newsletter, without the photos that I've now scanned. I know I was a bit excited when I first saw Michael in the flesh for the first time, luckily I recovered before I had photos taken with him! It's not over. It will never be over. Thank you, very entertaining! I remember reading this in the newsletter and thinking, "I'd love to go to a convention!!" 1998 was my first. My first Michael in the flesh experience was at the 2003 con and I was a 'bit excited' too, haha. In fact, when I heard he was in the building, my excitement caused me to become very ill - I will not go into details because it ain't pretty!! My first Michael in the flesh experience was at the 2003 con and I was a 'bit excited' too, haha. In fact, when I heard he was in the building, my excitement caused me to become very ill - I will not go into details because it ain't pretty!! Oh dear! I felt very excited to meet him for the first time at this years con. I was just very embarrassed and didn't say a word to him, apart from my name :-[ Thankfully I wasn't ill though. Ta ra for now my lovelies ! Noticed the broken links for the images of this Convention will reupload and reset links not quite sure why links are broken as they did work a year or so ago. I don't know what had happened to the links, but I put them all back in again. I didn't realise how far back you went with RoS (and other programmes') conventions, but a convention with RoS and B7 sounds like heaven! Glad to see you were both having a great time and that things haven't changed so much over the years, there are still great RoS conventions to go to! Brilliant picture with Lucy & Michael and the cast picture! Yes indeed had a slight glitch with Photobucket where the images stopped working. But Lucy has sorted it. It all seems so long ago now.. Still 2016 will be a good year for RoS fandom and hopefully for many years to come.